The villagers have reported that they have had to chase away a wild boar and her piglets from under the volunteer's hut. She wanted to make it her home! This is a picture of where the volunteers will be staying while living and working in the village. 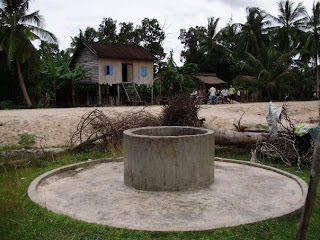 In the foreground is the well they will use to shower, wash clothes, dishes and everything else. No electricity, hot water or luxuries in this village. I hope they can cope!